Getting Started in Screen Printing. How it Works and What You Need! Screen Printing Process From Start To Finish, Thanks To Ryonet! CRAZY HOME SCREEN PRINTING SETUP! HOW TO SCREEN PRINT A 3 COLOR SHIRT AT HOME (Wet on Wet) Screen Printing With Eva! 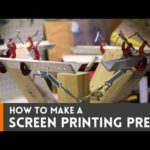 how to screen print on paper......A beginner's guide to screen printing, by a complete beginner.